When I moved to NYC from Wyoming five years ago, I went from a state with a population density of six people per square mile to a New York apartment with six roommates. I knew if I was going to keep my sanity, I’d need to find ways to escape the crowds and breathe in the outdoors -- which has become impossible to do in the city's parks and beaches. 42 million people will visit Central Park this year, according to a new report in the New York Times, up 7 million from 2011, and crowds on the High Line have tripled since 2010. Fortunately, there are plenty of ways to get out, even if you don’t have access to a car -- I mean, a car definitely helps (and if you've got one, hit these upstate NY hiking spots), but any of the following places can be reached without one. If you’re willing to lug a bike onto a Metro North train, your outdoor possibilities will expand quite a bit. But even if you’re just going to stick to public transit and your own two feet, there are plenty of places to explore. If you want to get more creative, or just want to make some new friends, also consider joining an outdoorsy Meetup (more on that below). There are many groups around the city that organize carpools for hiking, camping, and other outdoor excursions. 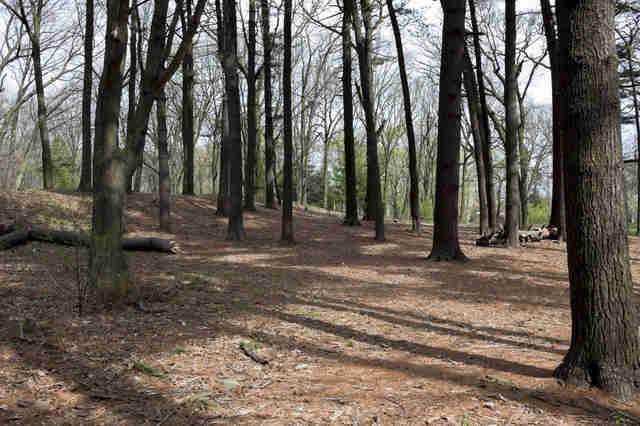 This giant wooded park in Queens is one of NYC’s best little-known gems. The park, which also includes athletic fields and an 18-hole golf course, has 165 acres of forest with hiking paths that make you feel like you are miles outside of the city. But you’re not -- you’re in Queens! The woods are rarely crowded, even on beautiful days, and it’s the best place in the city to let your dog run free, provided that you keep it from spooking the horses. Oh -- and there’s horses! Lynne’s Riding Center operates a private stable on the edge of the park and offers riding lessons on the Forest Park trails. If you need a woodland reprieve from the city without the hassle of actually leaving the city, Forest Park is a godsend. How to get there: The Q21 and Q53 buses come right to the park, and the J train comes within a half mile, at the 85th St - Forest Parkway stop. 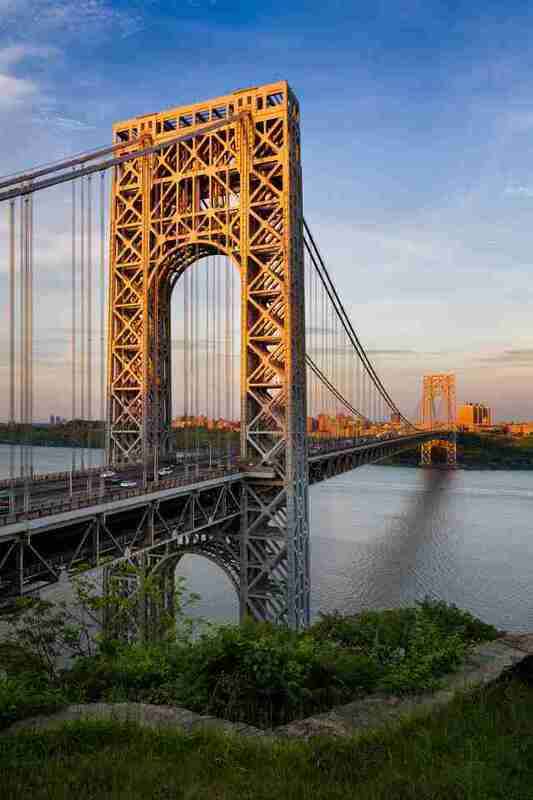 Driving can take anywhere from half an hour to an hour from Manhattan, depending on traffic. Look for parking on Myrtle Ave, after you cross over Woodhaven Blvd. If you’re into medieval religious art, the Cloisters museum is one of the best places, if not the best place, in the US to take it in, since the whole museum was built in the architectural stylings of a medieval monastery. But if, like most people, you could kind of take or leave medieval religious art, a trip up to Washington Heights/Inwood is well worth it just to walk around the grounds of the surrounding Fort Tryon Park. With eight miles of pathways, and great views over the Hudson River, it’s one of the quietest, most relaxing green spaces in the city. It’s much further uptown than Central Park, which cuts away all of the crowds and tourists -- and getting there is half the fun, if you bike. How to get there: The park is accessible off the A train, at 190th St. But the best way to get there is to bike up the Hudson River Greenway, which you can bike in an hour from Downtown, on almost uninterrupted greenway bike lanes for most of the way. Harriman State Park is the best friend of anyone in NYC who gets desperate for regular time away from the concrete jungle. 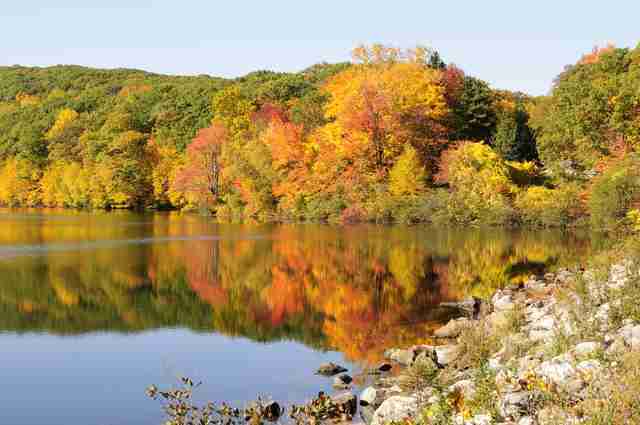 The second-largest state park in New York, Harriman has 225 miles of trails, including pieces of the Appalachian Trail, and is by far the best one-stop shop in the area for hiking, cross-country skiing, boating, fishing, and camping. With more than 47,000 acres of forest, lakes, and mountain tops, Harriman is marvelously large for being so close to the city -- big enough that there is endless territory to explore (and not toooo many people), but close enough to be worth it for a day trip or overnight camp. It’s got foliage worth traveling for in the fall, great views through the bare trees in winter, and in July and August, you may even find wild blueberry bushes to graze on. Lake Sebago is a popular destination for swimming and canoeing, and if you’re looking for hiking trails, you can’t go wrong anywhere -- check out MyHarriman.com, a great resource for information about specific hikes and activities. Where to camp: If it’s camping you want, there are plenty of options, but keep in mind that sites more accessible to roads and parking lots will also have more crowds. For car camping with facilities and plenty of company, check out Beaver Pond Campground. For rustic camping with just a short hike in, try the overnight parking lot off Kanawaukee (set GPS or Google map to 41.23038 N, 74.13996W) that accesses Tom Jones shelter a half mile in, or Bald Rocks shelter, which offers some of the best views in the park on the 1.5-mile hike in. Or, for more secluded lakeside camping, seek out the rustic campsites surrounding Pine Meadow Lake, where there's plenty of peace and quiet, and great swimming. Park your car (or bike) at Lake Sebago’s south shore off Seven Lakes Drive and make the two to three mile hike in to find your getaway. How to get there: Harriman is easiest accessed by car -- the park is just 25 miles north of the George Washington Bridge and can be reached in just an hour in good traffic on Saturday mornings. But the adventurous can find it even without a car. Take the Metro-North Port Jervis line to Sloatsburg; from there it’s a two-mile walk or bike ride to Reeve’s Meadow parking lot on Seven Lakes Drive, which has trailhead access to plenty of good hiking trails, including trails that take you another three to four miles to campsites on Pine Meadow Lake. 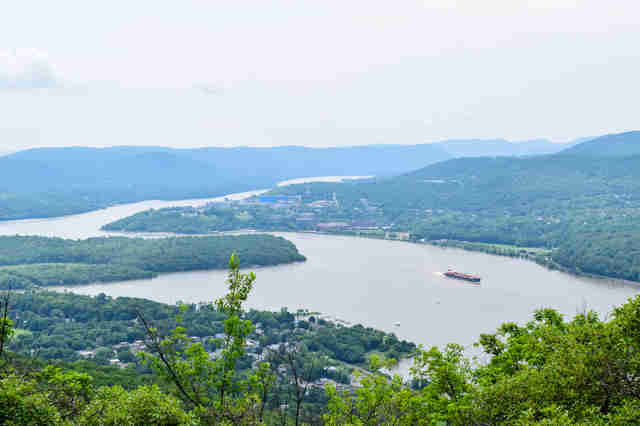 The best public transit-accessible hiking in the NYC area, Breakneck Ridge Loop is right off Metro North, and presents a challenging 2.8-mile hike, with some epic views of the Hudson River that you definitely have to earn. From the trailhead, the loop begins with a rugged and strenuous rock scramble that you’ll probably need all four limbs to climb. 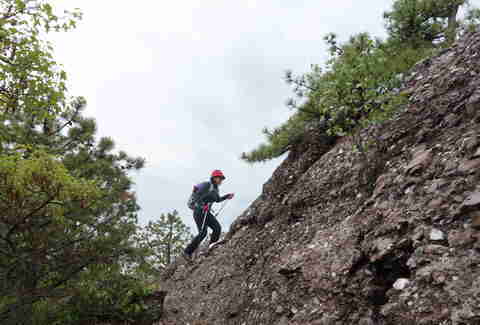 But you’re quickly rewarded with numerous lookout points that make the climb well worth it. The easy access off Metro North ensures that you’ll have plenty of company on your hike, but it still beats the hell out of fighting the crowds walking up Broadway. How to get there: The Metro-North Hudson line stops right at the Breakneck Ridge Loop trailhead -- hence the crowds -- but it only makes that stop on weekends and holidays. Otherwise, it’s about an hour to an hour and a half drive from the city. 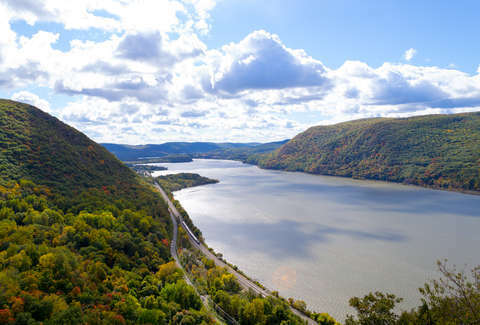 If you want a hiking trip in which it is quite possible not to see another person the whole time, Schunnemunk in the Hudson Valley is the under-the-radar choice that can deliver that kind of solitude. With forests, meadows, and mountain tops, it has the same topography of more frequently visited Hudson Valley destinations like Harriman, Bear Mountain, and Storm King State Parks, but there’s one big thing Schunnemunk is missing: all the people. How to get there: Getting to Schunnemunk without a car isn’t as cut-and-dried as Breakneck Ridge, but it can definitely be done, especially if you’re willing to bring a bike onto Metro North. Take the Port Jervis line to Salisbury Mills-Cornwall, which gets you within three miles of the Otterkill Road trailhead (put your GPS to 41.425755 N, -74.101685 W), where a six-mile loop with some steep climbs and nice views awaits you. With a car (Schunnemunk is about a 90-minute drive) or bike, there are a number of other easily accessible trails in the park, but this is the closest one to mass transit. 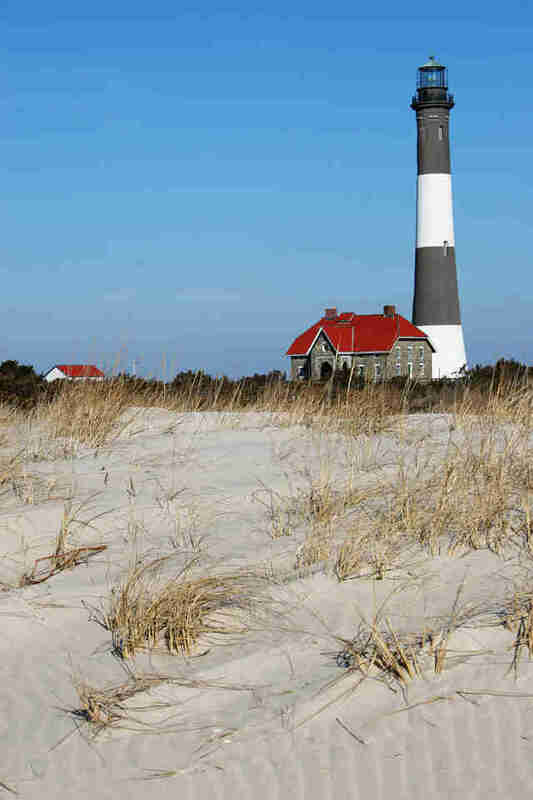 Unlike the inhabited western side of Fire Island, the nearly deserted eastern end of this narrow barrier island offers a secluded getaway for camping or day hiking and swimming. You’ll have to take a train and a boat to get there -- and you’ll need to reserve your camp spot well in advance -- but the reward is the most remote and pristine seaside camping in the NYC area, where you can pitch a tent on the sand at the Watch Hill campsites, and listen to ocean waters roll you to sleep. Watch Hill is also a worthwhile day-trip destination -- if a bit far from the city -- with a lifeguarded beach, and backcountry dune hikes along the water’s edge. Where to camp: There are 26 tent sites at Watch Hill campground, right on the other side of the ferry, or you can get backcountry permits for dispersed camping further down on the eastern tip of the island, which you also access via Watch Hill. Both options require advance reservations, and the limited spots fill up quickly, especially for weekends. How to get there: Take the LIRR Montauk line to Patchogue, then walk over to the Watch Hill Ferry ($17 dollars round-trip, operated by Davis Park Ferry) to get to the island. There is no driving allowed on Fire Island. Though not as purely natural an outdoor escape as the spots listed above, Storm King is one of the best outdoor activities in the NYC area. 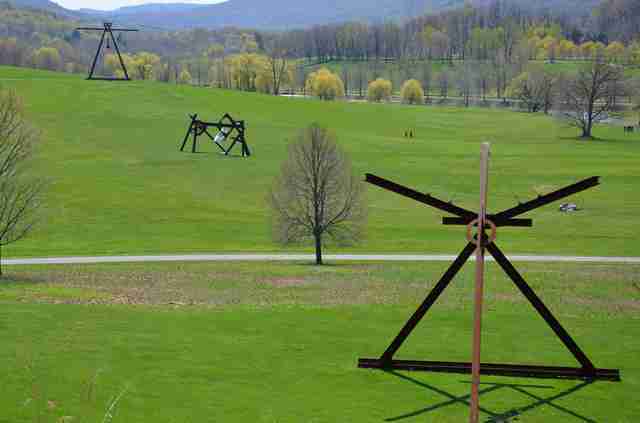 The 500-acre sculpture park of woods, meadows, and fields is a truly unique art experience, and a great place to walk around, get fresh air, and see more than 100 sculptures well-placed in a beautiful setting. Storm King is a fairly popular destination, so don’t expect to find solitude here, but it’s more than big enough to handle crowds without ever feeling crowded, especially if you head to the southern end of the park, where the sculptures are more spread apart. How to get there: There are two buses daily from Port Authority that take about 90 minutes, operated by Coach USA -- though one of them stops at an outlet mall (!) on the way back to the city. You could also theoretically take Metro North on the Port Jervis Line to Salisbury Mills-Cornwall, which gets you within biking distance of the park. Otherwise, Storm King is about a 90-minute drive from the city. There are tons of beaches around NYC you can reach without a car, but if you go during the summer, the beaches are better for people-watching than they are for getting away. 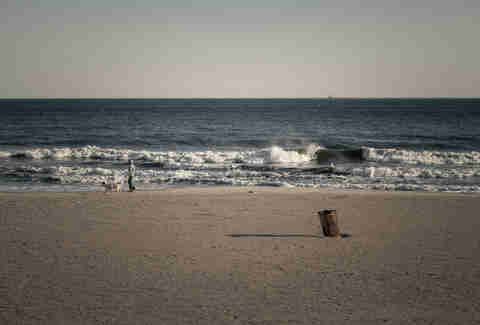 Not so in the offseason -- head to any of the New York area beaches in the spring or fall and you'll have the place pretty much all to yourself, even at some of the closer ones like Jones Beach on Long Island or Rockaway Beach in Queens. You can even bring your dog with you to Rockaway Beach after Labor Day and before Memorial Day. NY Ski & Snowboard Club - Organizes trips and carpools to NYC-area ski hills. Brooklyn Ski & Snowboard Club - Organizes trips and carpools to NYC-area ski hills, with carpool pickups near Boerum Hill and Hell’s Kitchen. New York Backpackers - Serious outdoor adventure group that organizes day hikes and camping trips, plus rock climbing, kayaking, all kinds of skiing and winter expeditions, and happy hours in the city. Hiking and Nature - Organizes group hiking trips accessible via NYC public transit and/or carpools, from short relaxing hikes to serious 20+ mile excursions. Kayaking the Liquid Skies - Kayaking excursions for paddlers of all levels. Northeast Canyoneering - For serious, experienced adventurers, this group organizes canyoneering and repelling trips around the Northeast. Bison Messink is the Deputy Editor at Thrillist, and hopes this doesn't mean all his favorite camping spots will be too crowded now. Follow him on Twitter and Instagram.